Conduit is metal or plastic tubing used to create a protective channel for electrical wire. The channel, along with electrical boxes and devices that join the conduit pieces, is known collectively as raceway. In a household wiring system, most of the circuit wiring is in the form of insulated cable that is run inside wall, floor and ceiling structures without conduit. Conduit typically is used only where circuit wires are exposed (or surface-mounted or buried) and therefore need protection from damage or moisture. Conduit offers protection to electrical wires that run in exposed locations. Conduit usually contains two or more individual insulated wires. This marks another distinction from cable, which consists of multiple wires encased in a protective jacket or armor. Cable typically is not run through conduit. 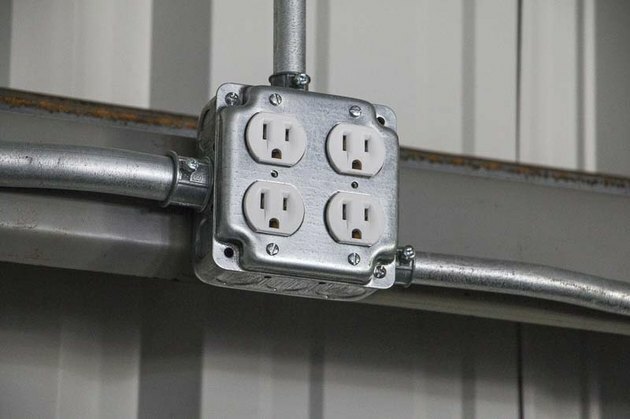 In a standard installation, an entire raceway—including the conduit, boxes, connectors and fittings—is installed before the individual wires are threaded through the raceway. Electricians call the wiring phase "pulling" or "fishing" because the wires are pulled through the raceway with a flexible metal ribbon called a fish tape. Each type of conduit has its own fittings (which connect lengths of conduit together) and connectors (which join conduit to boxes). Fittings include straight couplings and various elbows and tees, much like plumbing fittings, for extending or changing the direction of the conduit run. Some fittings have removable plates or covers that provide access to the conduit interior to facilitate pulling the wires; when installed, these are often referred to as "pull points." Electrical metallic tubing, or EMT, is the most common type of conduit for exposed interior installations, such as in a basement or an unfinished garage or workshop. 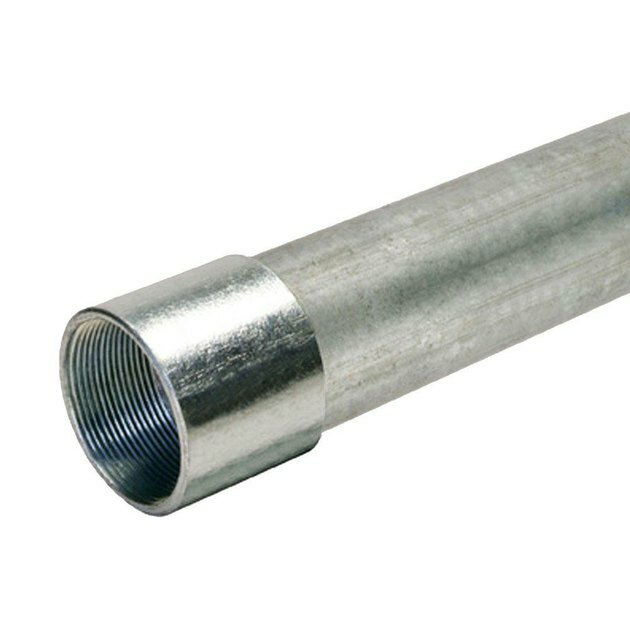 It is the lightest and thinnest of the rigid metal conduit types and comes in a few different diameters; 1/2-inch is the most standard size for household circuits. EMT is also called "thin-wall" and is relatively easy to bend with a tool called a conduit bender. EMT conduit is the most common type of conduit used in residential applications. EMT is permitted by the National Electrical Code (NEC) for dry and wet locations but requires special watertight fittings and connectors in wet locations. With proper installation, EMT raceway can serve as a circuit ground path and be used in place of a separate ground wire running inside the conduit. 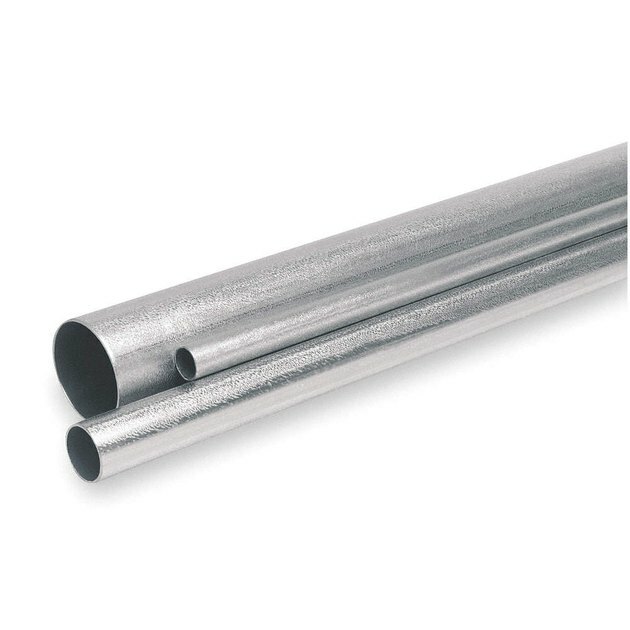 Rigid metal conduit and intermediate metal conduit are heavy-duty, rigid metal tubing used for structural applications, typically outdoors. If your home has overhead service wires (coming in from the utility) that connect to a pole on top of the roof, the pipe that extends above the roof is probably RMC or IMC. Both types of conduit also may protect the wiring going into and out of the service panel (breaker box). RMC and IMC can be used interchangeably, with IMC more common these days because it's lighter and somewhat easier to work with than RMC. They are permitted for use by the NEC in dry, wet and corrosive locations and can be buried in many applications. They typically are joined with threaded connectors and fittings. Flexible metal conduit is best known by its nickname "Greenfield," for its inventor, Harry Greenfield. 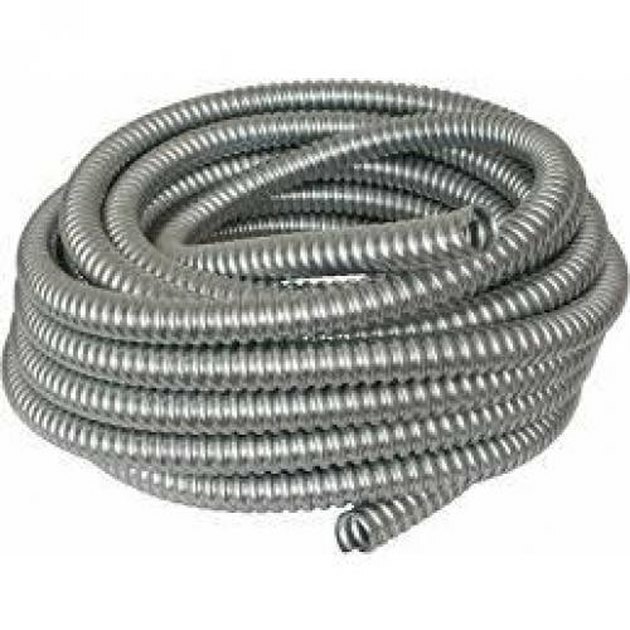 It is a spiraling metal tubing that bends easily and is commonly used for short, exposed runs in household circuits, such as connections for garbage disposers, hot water heaters and furnaces. FMC is suitable for dry locations only and must be supported every 4 1/2 feet and within 12 inches of each electrical box. It can be used as a ground path only with approved fittings and only where flexibility is not an issue after it is installed. For example, if it's connected to a motor that vibrates, the conduit cannot be used for grounding. 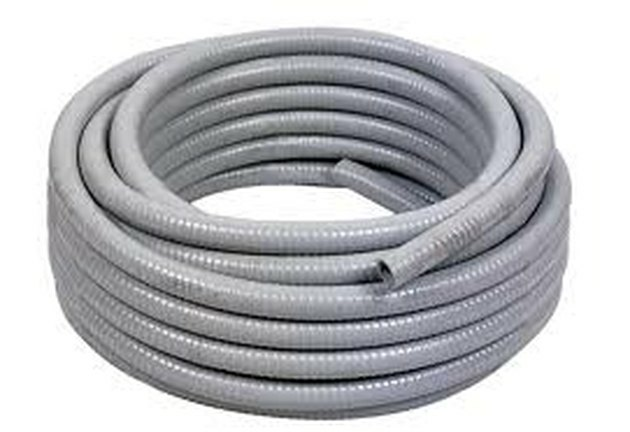 Rigid polyvinyl chloride conduit is plastic tubing that's sort of a thin version of PVC plumbing pipe (and is usually gray instead of white). It can be heated and bent to change direction but is more commonly routed with elbow fittings. Connections are solvent-glued, similarly to the way PVC plumbing pipe is handled. The glued connections make the raceway watertight, so PVC can be used for outdoor and underground applications, as well as for dry and even corrosive locations. Because PVC is nonconductive, this conduit cannot serve as a ground path. PVC is most commonly used for underground outdoor circuits, such as for landscape or yard lighting systems or for circuits providing power to sheds or detached garages. You also see it extending from the bottom of outdoor service panels. It cannot be used to support fixtures and is not allowed where it may be subject to physical damage. 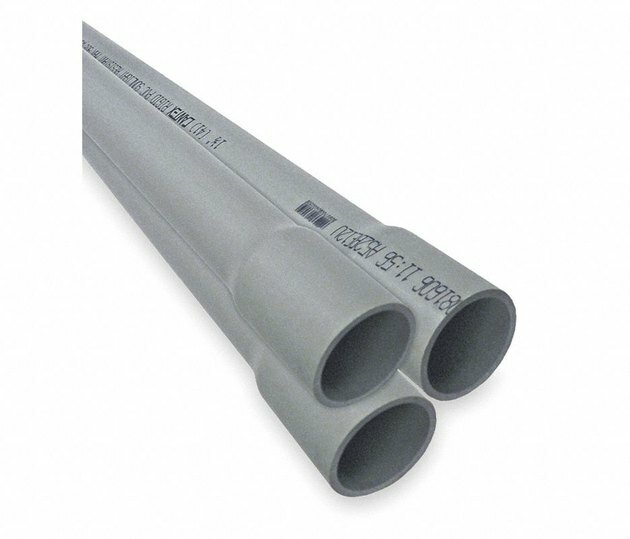 Liquid-tight flexible metal conduit is a flexible metal conduit coated with plastic sheathing to make it watertight. It is permitted in dry and wet locations and is most commonly used to protect wiring between an outdoor air-conditioner unit and the unit's disconnect switch. LFMC also can be buried if the materials are approved for the application. It uses special threaded and gasketed connectors to maintain watertightness.